1. The first cannabis sold will end up in a museum. 2. Colorado citizens can buy up to an ounce a day. 3. Non-residents of Colorado can only buy ¼ ounce a day. 4. You can carry up to an ounce. 5. There's a $50 fine for open cannabis containers in a car, just like with alcohol. 6. Cannabis tax on your weed is about 31.4%. 7. The first $40 million is reported to go to schools. 8. $1 million worth of cannabis was sold on the first day. 9. Colorado is predicted to make $600 million in the first year. 10. $67 million of that will go to taxes. 11. More cities have banned recreational cannabis facilities than accepted it. 31 cities have allowed recreational cannabis facilities. That may sound like a lot but 82 cities have banned recreational cannabis facilities. 20 of those cities have only banned them temporarily until late 2014. 12. You can only smoke cannabis on private property. 13. 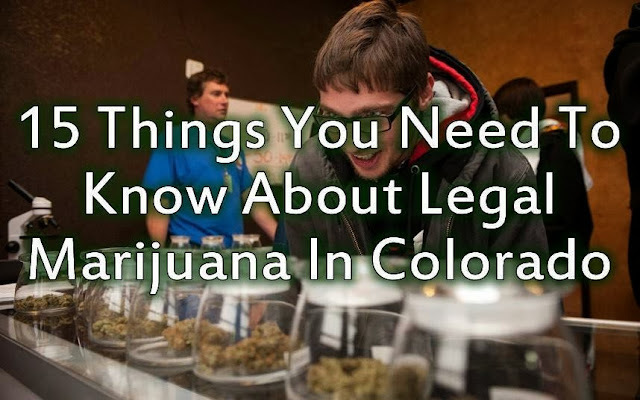 It is illegal to take your Colorado cannabis out of state. 14. You must be licensed to sell cannabis. 15. Everybody is happier in Colorado!